- Tweeter speakers are usually small in size 0.5 inches to 4 inches, depending on the brand and capabilities of the frequency range. This is a function of the tweeter reproduces high-frequency coverage in the range of 3500 Hz to 20 Khz. Examples of high-frequency sounds such as a such as vowel sounds, cymbals, drums and other musical instruments clatter. Tweeter was also known as the super tweeter / ribbon tweeter. This type has a different shape than regular tweeter, usually rectangular shaped thin plate and capable of producing high frequency sound that can not be reached by regular tweeter, which is in the range of 5-23 KHz. - Midrange speaker is usually measured about 3-4 inches that has a frequency range of 350-4500Hz. Midrange is usually included in the first set of 3 way car audio system. His job to help you enhance or accommodate high frequency vowel sounds to be more focused and clear. - Midbass is a type of speaker that is also called midwoofer, function to produce a sound with a frequency range of 80-350 Hz. The resulting sound is dominated midbass in a low voice. Usually midbass has a diameter of 5-7 inches. - Subwoofer or woofer, serves to deliver low-frequency noise or bass sound. For the woofer is limited in the frequency range 100 Hz or below, but the woofer is capable of spitting sounds in the frequency range 40 Hz and below can be called as a subwoofer. In subwoofer usually has a size of 12, 15, 18 inch woofer while about 8-10 inches. 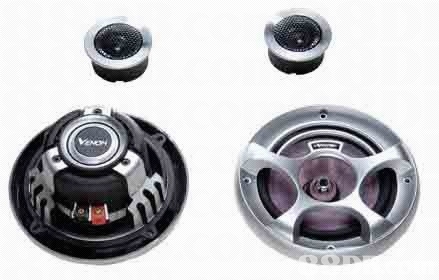 Hopefully by knowing the type of speakers, you can maximize your car audio.